Unlike yesterday’s post there is no need to explain that this is a large grizzly bear. It just is! Male because of the large dorsal fin as the species shows considerable size difference between males and females. Adult males develop larger pectoral flippers, dorsal fins, tail flukes, and girths than females. 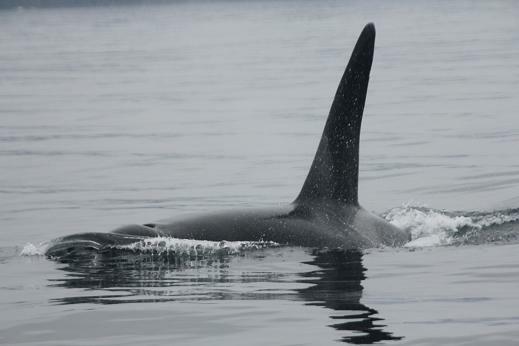 Resident because the dorsal fin is rounded at the tip and curved and tapering while the transient is shorter and sharper. The other key reason that this is a resident is that it is coming close to the boat while transients are less curious and will not approach a boat. The morning view across the bay in front of the Lodge. Guest are called between 6:30 and 7:00 for an 8:00 or 8:30 departure depending on the time of the season. A good breakfast is on the table and most important fresh coffee or tea. 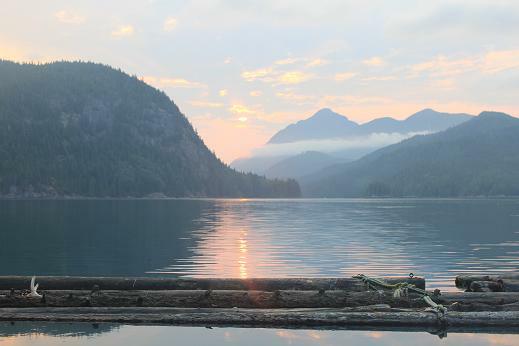 This photo shows the tail end of a beautiful sunrise over calm waters. 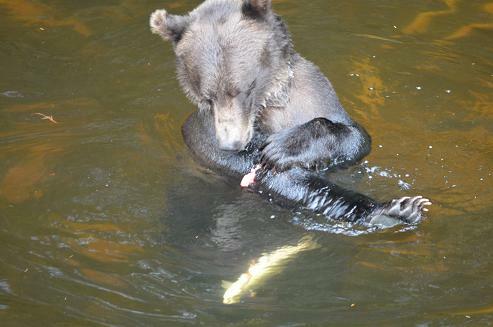 When a grizzly bear is more concerned about a small piece of salmon on its leg than the one slipping into the water it means it is not worried about catching another. The white shapes in the water around the bear are salmon. The past summer was very hot, the water level in the river low which caused low oxygen content in the water and a die off of several thousand salmon. 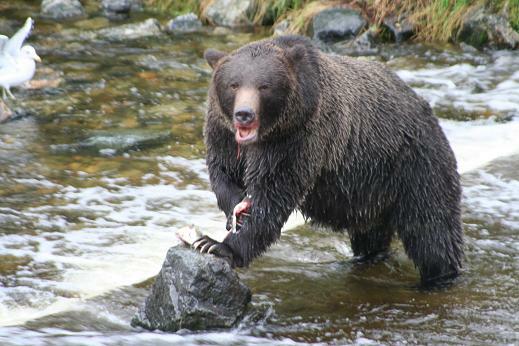 For this reason the grizzlies knew they could easily catch salmon to eat. This lasted for several weeks until the rains came and fresh salmon moved up river. The first half of the grizzly bear watching season occurs along the shores of Knight Inlet, the Glendale River estuary and up the river. There are eight to ten bears that are in this area all the time then some come for a time then move on to another area. 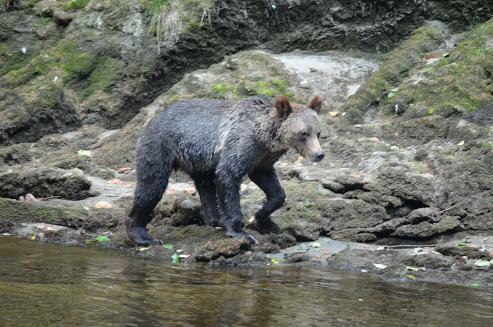 This bear we encountered while on the river was one of those around for a short time. It was very cautious and constantly glancing our way unlike the “resident” bears, which tend to ignore the boats and people. Normally the only thing that will really make a bear leave suddenly is another larger bear. Steller sea lions are social and gather at various times throughout the year when mating and breeding are not taking place. They use traditional haul out sites (an area used for resting) and rookeries (an area used for breeding and rearing young) on remote and exposed islands. These sites can be rock shelves, ledges, boulders, and gravel or sand beaches. Even in crowds, the big bulls are unmistakable—they are three times larger than females. Steller sea lions range throughout the Pacific Rim (from northern California to Northern Honshu in Japan, and to the Bering Strait). 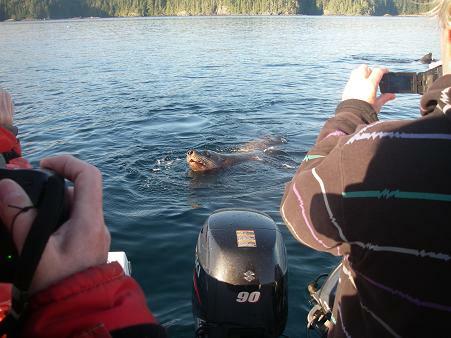 About 70 percent of the Steller sea lion population reside in Alaska. They do not migrate like some pinnipeds, but they do move seasonally to different feeding and resting areas. 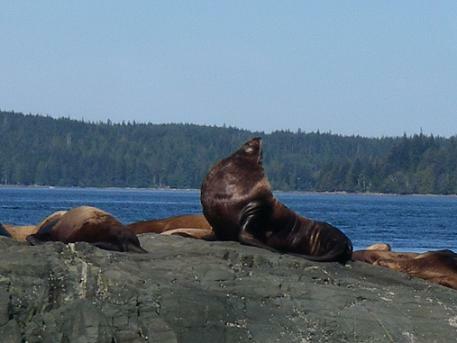 Late May and early June as well as September and October seem to be the time of the year when there are more sea lions in our area. However over the past several years more have remained in the area all year. In the water they do not seem that large but they are curious and often visit us as we watch them on shore (see tomorrows posting). Pacific white-sided dolphins are frequently viewed on all our wildlife tours. There are estimated to be 900,000 pacific white-sided dolphins in the North Pacific. Dolphins travel in groups throughout their lives. 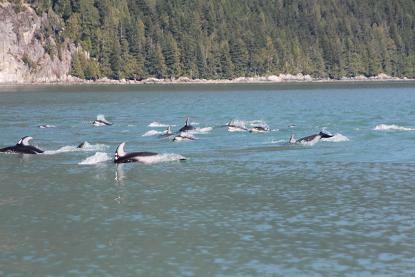 In B.C., Pacific white-sided dolphins are usually encountered in groups of 10 – 100 animals, although some groups have been seen with 2,000 or more individuals. Dolphin remains are present in First Nation’s middens (waste heap) dating back 2,000 years, but were rare in B.C. during the 19th and 20th centuries. They were first spotted by fishermen in 1956 north of Vancouver Island, and sightings became more common in the 1980’s as Pacific white-sided dolphins started to spend more time in inshore waters and inlets along the B.C. coast. It’s possible that their long absence was related to a change in ocean temperatures and a shift in their prey distribution. We had been watching this mother catch, eat and share salmon with her cubs for about forty-five minutes. As this mother decided it was time to move on the one cub did not want to but a few growls and it grabbed the salmon it did not want to leave and started to follow. As first year cubs they do not stray to far from their mother even for food. For the first half of the season at Grizzly Bear Lodge our bear tours require us to use a skiff to view the grizzlies along the shore of Knight Inlet and in the Glendale River. 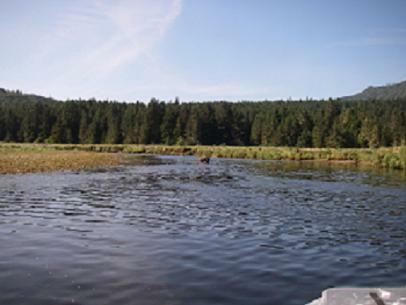 As the tide starts to rise we move up the river to view the grizzlies grazing on sedge grass or digging up roots and as the salmon arrive they are in the river. The first sighting (picture above) of a bear is the most exciting and the guests start taking photos and do not seem to listen when the guide says their will be better opportunities later (picture below). As we move up the river we stay to one side and the bears are often just across the river, a river that is only 15 to 20 meters (yards) wide. The bears have accepted our presence and as long as we are quiet and make no sudden moves we are ignored. It is very difficult to get one great picture of a breaching whale but to get two on the same trip is a testimony to the ability of the photographer and the number of breaching whales. It was one of those days with many breaches but most of them while in range to see the breach and splash not always in range for a good picture. 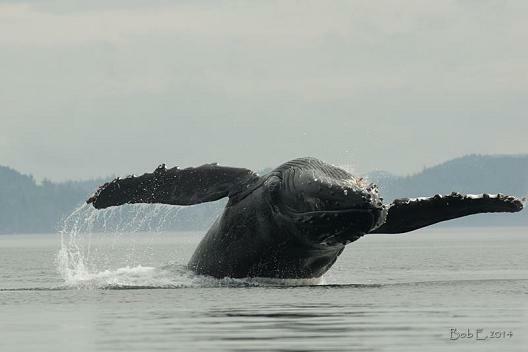 Whale watching safaris from Grizzly Bear Lodge normally encounter orca, humpback whales, dolphins, porpoise, sealion, seals, eagles and a variety of marine ducks.